EVER DRINK A HEAD OF LETTUCE? I certainly had not, until I made the soup you see pictured up top. And what a taste-sensation — earthy romaine, pungent garlic, celery-ish lovage, and anise-y tarragon all mingled together in a brew of emerald-green deliciousness. Although the soup is quick and easy to prepare, I think it is elegant enough to serve as the first course for a formal dinner. You can make this soup with any number of lettuce greens. I used romaine, because it gives the soup a jeweled hue, while contributing lots of flavor. The dark outer leaves are particularly flavorful. To achieve the freshest romaine possible, I simply pulled an entire head out of my Herb Garden. After pulling up the romaine, I snipped 20 leaves from my lovage plant (which, in its third year here, is now 6 feet tall!). 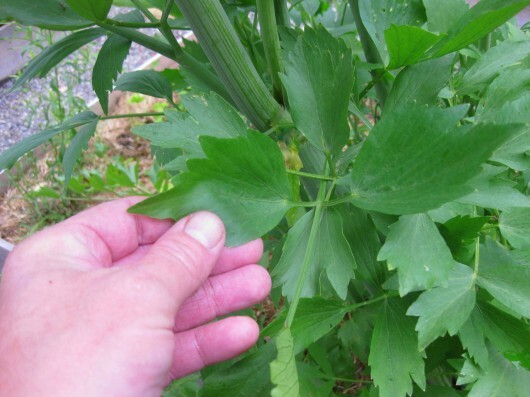 Lovage is an incredibly easy-to-grow perennial. It has a strong celery flavor, with an undertone of anise. 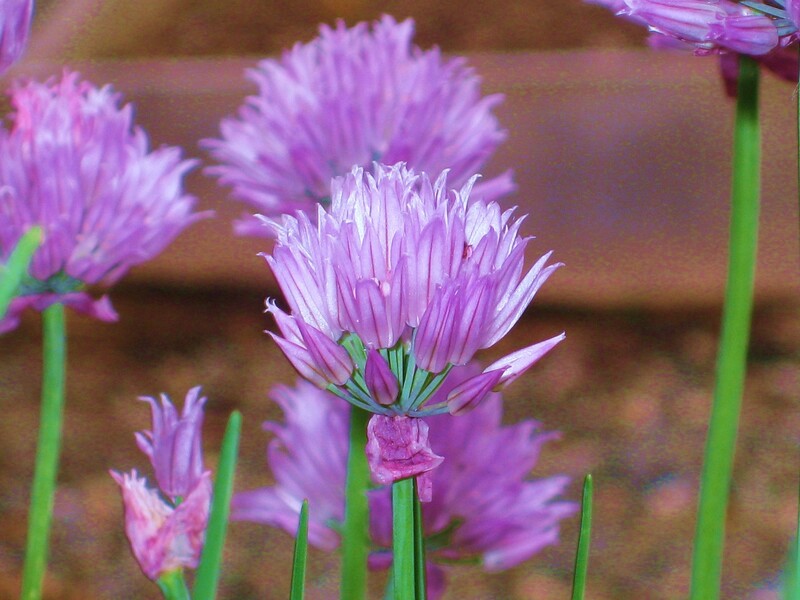 To decorate the soup, I grabbed a few chive blossoms from the garden. There were only a few blossoms left on the plant, because I’d already used the others for Chive Blossom Vinegar. The lavender-pink buttons make an attractive garnish for soups, and of course you can pull apart and scatter the petals on everything from eggs to pasta. I hope you’ll make this healthy soup. It’s delicious…right to the last drop. *If you can’t find lovage locally, increase tarragon to 4 tablespoons. 1. Making the soup base – Melt the butter over medium heat in the large sauce pot. Add the onions and garlic, stir to coat with butter, then cover the pot, and reduce heat to low. Cook until the onions and garlic are soft and just slightly colored — about 10 minutes. Add the stock, increase the heat until a simmer is achieved. Let simmer for about 5 minutes. 2. The lettuce, lovage, and seasonings – While the stock is simmering, slice off the root end of the romaine. Then roughly slice the lettuce crosswise into 1-inch pieces. You do not have to separate the individual leaves. Roughly chop the lovage leaves. 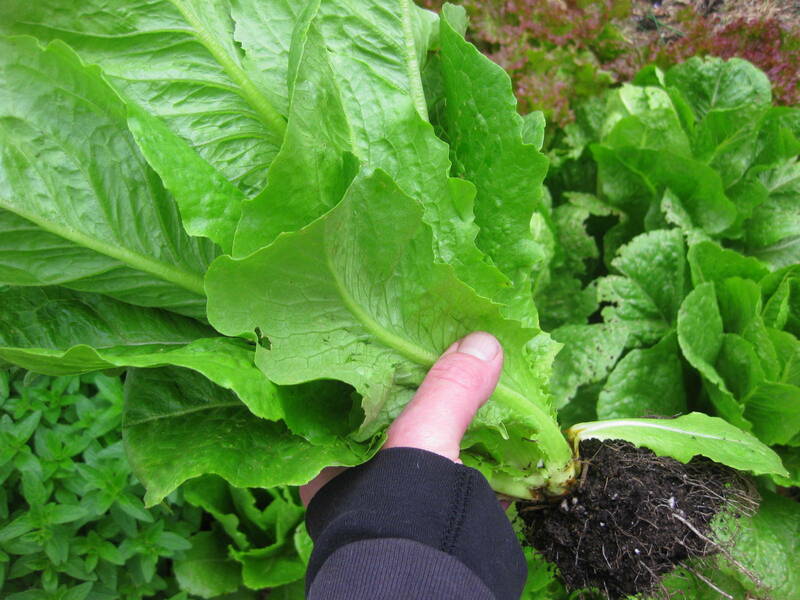 Rinse both lovage and romaine in a big bowl of cold water, then drain in a colander. Add the lettuce, lovage, tarragon, salt and pepper to the simmering stock. Stir with a wooden spoon until these leaves have thoroughly wilted — about 5 minutes. 3. Finishing the soup – Transfer, in 2-cup batches, the soup to the blender. Blend first at low speed (to avoid splashing) and then gradually increase the speed up to high until a smooth puree is achieved — about 1 minute. Pour each finished batch of puree into the smaller pot. Taste the soup carefully — you may wish to add more salt. 4. Serving – Ladel the soup into individual soup cups or bowls. Garnish with a dollop of sour cream and a chive blossom. If you don’t have chive blossoms at your disposal, the sour cream alone will suffice. Or, you can drizzle creme fraiche (thinned with cream to a pourable consistency) over the soup. 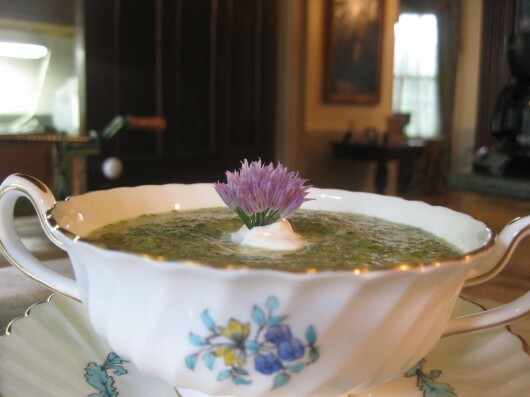 Lettuce & Lovage Soup is delicious hot, warm, and even room-temperature. Think you’ll try this uncomplicated but sophisticated soup? You can let me know by leaving a comment. finally! A recipe for *cooked* lettuce! Thank you! shar – Nice to meet you. caitlinvb – If you make this soup, let me know how it turns out for you. Obviously I think it’s divine! Kevin, I want to grow lovage! It’s beautiful. I want to make the soup too. Thanks for all your wonderful ideas, always. On another note, I’ve been pulling the suckers off my tomato plants and I’ll report back. Brigid & beetree – Realizing that not everyone has (or can get) lovage, I’ve renamed this beautiful brew “Lettuce Soup.” Simply omit the lovage and double the amount of tarragon. The soup will still have the same gorgeous undertone of anise. Try it! I can’t wait to try this recipe. I am having friends over on Saturday and I think I will test it on them. It’s will be a nice addition to the meal. Thank you! Sean – Yeah! Let me know how it works out for you. 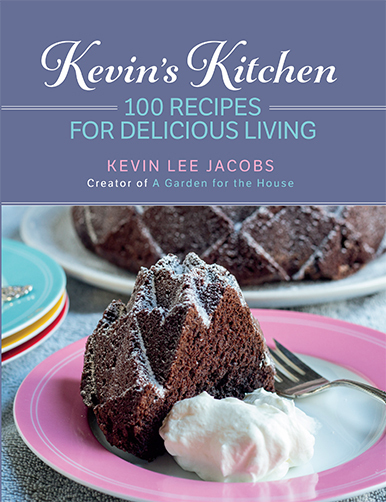 Sounds delicious, Kevin. Could you substitute Celery leaves for the Lovage (of course, now I MUST plant lovage!)? Could we have some more cold soup recipes for summee, please? Bonnie – Celery leaves, I think, would be a great addition to this soup. But I’d still add the extra tarragon as a sub for lovage. Brilliant, as always! Reminds me of my mom making the Leftover Green Salad recipe from the Joy of Gardening Cookbook. She swore by it, and I have never tried it! (I usually scarf it down for breakfast with a fork :)! Kevin, this is a fabulous idea for my escarole heads that are deciding it is time to bolt. Think I will capture their essence in your soup. Thanks so much! Now off to explore your lovage post. I think that is what this farm has been missing. Can’t wait! thanks for giving me a recipe for my gigantic lovage! sounds great! I love soups and want to try this one soon! I made it with romaine lettuce as well. I didin’t have time to go to the farmer’s market to get lovage so I doubled up on the tarragon as suggested. I snipped some chives on top. Delicious. I served it slightly above room temperature, but you could definitely serve it warm or cold as you said. This is hands down one of my favorite soup recipes and it’s the first recipe I have tried of yours. I sure will be trying more and actually making this one again next weekend! 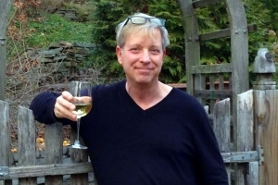 Sean – Glad to hear that you and your guests enjoyed the soup! I’ve grown lovage for a long time as a garden oddity, but this soup looks superb. I will try it tomorrow, along with the recipe for garlic scape pesto. I especially appreciate the seasonality of all your recipes. This is a wonderful resource. Many thanks for taking such care. I have a humongus lovage plant, this is perfect for me. I made it over the weekend, and even my favorite carnivore vegetable-phobic friend loved it. The taste is distinctive. I used greek yogurt rather than sour cream, but otherwise followed your recipe exactly. Perfect spring recipe. Jo Ann – So glad you tried the recipe, and that it worked out for you. Drinking this soup — for me, anyway — is like drinking delicious, green healthiness. Pat – Isn’t it amazing how tall lovage can get? I just cut mine back by 2/3s. Since its March emergence, it had grown like Jack’s beanstalk to nearly 8 feet. Love this! I can think of all sorts of variations; how about a Caesar Soup? That could be really interesting with the anchovies melted into the olive oil (instead of butter), and the dressing added as a drizzle when served with the garlic crouton & grated parm. Today, I had a bunch of cress which went in a bit after the romaine & fresh tarragon. i also added a bit of fresh dill. When I reached for goat milk yogurt to use in place of the sour cream (it’s what I had), my eye fell on the basket of nectarines. Hmmmmm? Chopped up a bit & used that with the yogurt & a chiffonade of basil for garnish. Very, very nice! and the canine pre-wash crew approved was well with three heads in one bowl. Joy – Yes, yes, yes! The variations on this soup are endless. And I love how you mentioned the “canine pre-wash.” We have that same dishwasher-cycle here, courtesy of a beagle named Lily. 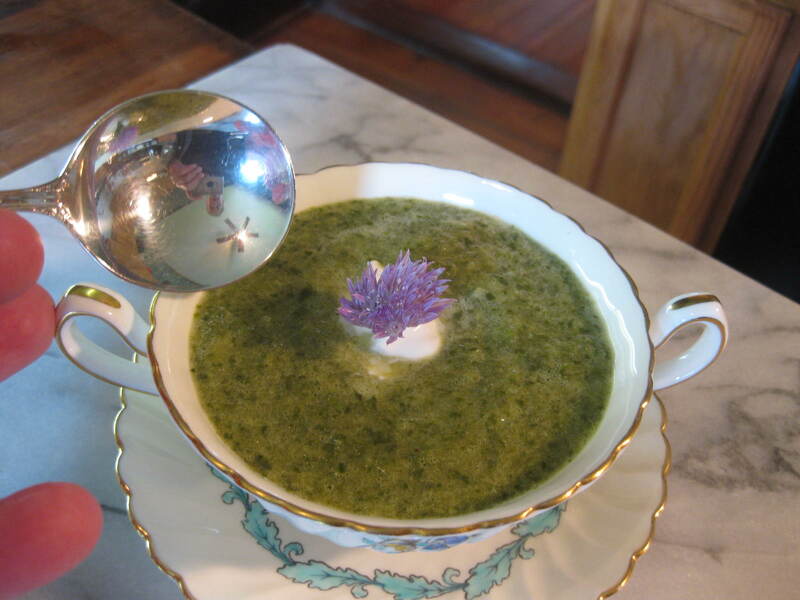 I made this soup for Mother’s Day and served it in teacups. Everyone had seconds. It’s so easy, I’ve made it since. I tend to go heavy on the lovage because I have so much of it but can’t think of a better way to use it. Thanks for another great usage for lovage leaves. Normally I just dry the leaves to use in the winter for my soups and stews. I have some drying right now. I will be trying this, but veganizing it. Can’t wait to use the lovage from my herb garden. If you’re in zone 5, tarragon is an incredibly easy perennial, and fresh herbs are always better. For a springtime soup like this, there should still be tender tips. Why pay for imported dried tarragon when you can gather fresh from your yard? I’ll bet this soup would be really good served cold, too. Please let me know where I can purchase no-sodium chicken broth. Trader Joe’s soup is 90 mg. Thank you. I just attended a “Root to Stalk” class at our local garden center and our tremendous speaker made lettuce soup for all of us. It was missing something, a little bland. Yay! I have lovage and my tarragon comes up from seed every year. Herb growing may be my favorite part of gardening. 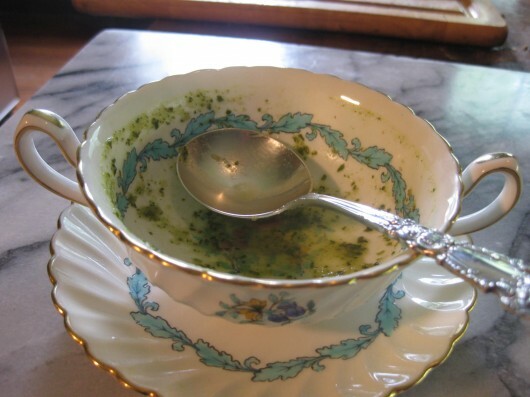 Now I know how to make lettuce soup and thanks to you I know to add lovage and tarragon. Thank you. We love lovage. I find that most people don’t know what it is. Can’t wait to try the two recipes I’ve found so far. Please post more if you have them. My lovage is only 1″ tall at the moment but I have high hopes! Will definitely be trying this recipe, and probably adding it to my range of frozen soups. Like the look of some other recipes too. Your seasons will be out of whack for me, as I’m in Australia but I’ll be searching through for appropriate ones. Thanks for the great site. The soup was delicious my wife was sceptical as I was making it. She finished a bowl to the last spoonful. I wonder about making a pot full and freezing it in small batches.